We would like to send out this friendly reminder to everyone about the important FBARs (Foreign Bank and Financial Account Reports) Tax Deadline. The deadline for the 2013 reporting year FBAR is approaching – June 30, 2014. The FBAR is required to be Electronically Filed this year, by the due date. If you or someone you know has a foreign financial account, take note! And it does not have to be just a personal account. Sometimes having signatory authority or a beneficial interest over a foreign bank or financial account also has reporting requirements. 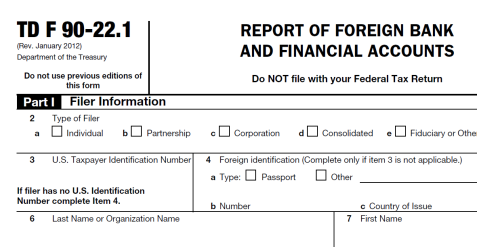 Last year, the Report of Foreign Bank and Financial Accounts, FBAR, (Form TD F 90-22.1) was changed to FinCEN Form 114. It is a disclosure report form required to be filed with the Financial Crimes Enforcement Network under the Bank Secrecy Act (BSA) on or before June 30th each year. This year the Form 114 cannot be mailed and must be submitted through the BSA’s e-filing system. Note: The IRS can levy a $10,000 penalty, per account, for a late or inaccurate filing. How Do I Know If I Need to File? You need to file this disclosure if at ANY time during 2013 you had foreign bank and/or financial accounts that, when combined, exceeded $10,000 (even if it is was just for a moment.) And this value is a cumulative number. For example, if you had four foreign accounts at $3,000 each, you would be above the $10,000 number and need to complete an FBAR form reporting all these accounts or risk a $40,000 penalty. What is Considered A Foreign Account? -A Bank of America account located at a Bank of America branch in France is considered a foreign account. -An account at the First Bank of France at a branch located in the USA is not considered a foreign account. -Money or metals held in a safe at your home in Yucatan is not considered a foreign account. -Money or metals held at vault, in which the foreign institution has an ID number for you, is a foreign account. If the account with the foreign institution holds money, tradable securities (stocks or other investments), insurance/annuity with a cash value or precious metals, or the like, you may have a filing requirement. Beginning July 1, 2014, banks around the world will be coming forward to the U.S. with information on their U.S customers. That is when the Foreign Account Tax Compliance Act, or FATCA, goes into effect. Currently, there are new streamlined procedures that minimize or waive penalties for unreported foreign accounts. However, if you come forward after the United States begins investigating the bank where the account is held, there are new higher penalties which can be 50% of the highest balance in the account(s)! If you are not certain whether you should file, don’t wait, ask your accountant or the IRS now! Posted: June 24th, 2014 under Financial Issues.